Here are some photos that show various techniques related to shooting. This is an example of a good stance. Note the bent knees, and how the shoulders are forward of the hips. Feet are about shoulder width apart. For most circumstances, stance should be made more aggressive by taking a half-step back with the right foot. 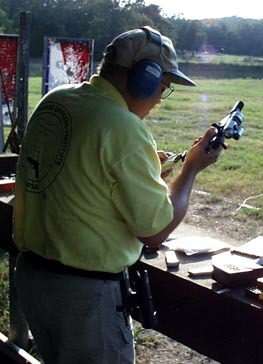 This is an example of the trip grip favored by the top shooters. Note how the trigger finger makes a right angle with the trigger, and how both thumbs are pointed at the target. All the fingers of the support hand are underneath the trigger guard, and there's minimal gaps between the hands anywhere. Also note that the firing hand thumb is up at the level of the slide (high grip). 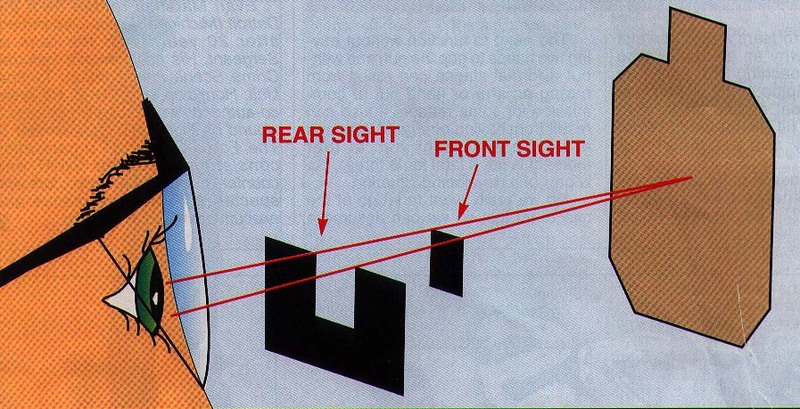 This is a good illustration of how the sights work. An example of a speed reload. Note that I'm looking down at the mag well, and that my finger is off the trigger. 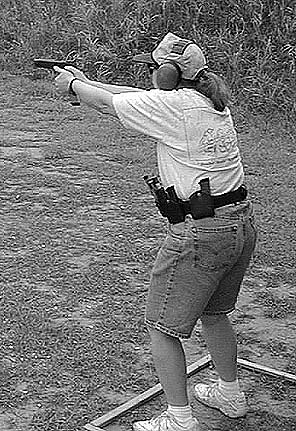 Ideally I'd like to have gun slightly higher and farther away from my body, so that I don't have to look down as far, or move the gun as far, to do the load.